In spite of its popularity among hipsters, the raw food diet isn’t just another popular fad diet. Nutritionists argue that raw food diets are not diets at all (in the traditional sense at least), but rather that going on a raw diet is a lifestyle change that simply involves lots of healthy, clean eating. Alternatively, a raw food diet is often called “raw foodism” and it means eating virtually all uncooked and unprocessed foods, all the time. The idea behind this is that you get the nutrients you need without any additives. So if you’re curious to know what this raw foodism is all about, keeping reading. What Is a Raw Foodism? When you eat raw foods, you get nutrients in their most natural state In fact, our bodies are designed to eat foods like this as we can digest them easily. Don’t think this means you need to throw away all your meet and become a raw food vegan. However, you will benefit health-wise by consuming a nice chunk of raw vegetables and fruits daily. Eating raw is nothing new; raw foodism has been a thing since the 1800s and studies done since then have shown how beneficial raw food diet can be. If you find yourself interested in eating raw, but wondering how much raw food should you should eat daily, you’re not alone. There is no strict “raw food diet” you have to follow; rather simply incorporating raw foods into your diet will help you. Also, you don’t need to eat 100% raw to eat raw foods. Every little bit will help you! There are a plethora of raw food “diets” you can try out. And again, you don’t have to stick to just raw foods. While produce should be the main part of your diet, you can eat sprouted grains, nuts, fermented foods, seeds, eggs, sea vegetables, fish, and some lean meats and dairy products. See what makes raw foods so good for you is that they contain no chemical food additives, they have not been produces using chemical fertilizers, or synthetic pesticides, and they have not been pasteurized or homogenized. What this means for you is that you must cut out most processed, packaged foods like condiments, cereals, breads, refined oils, processed meats, and cheeses. Cutting out all of these foods is no easy feat. Those of us who aren’t fond of most fruits and veggies in particular can have a difficult time on the raw foodism, but don’t give up hope. It’s all about baby steps. You don’t need to throw out all your packaged foods overnight, but rather little by little add healthy fruits and vegetables to your diet. In fact, research backs this up as those that “jump headfirst” into a a new diet often look at it as a quick, temporary fix, rather than a permanent lifestyle change. It’s only when you change your lifestyle that you can keep off your weight. Not to mention the benefits of adding raw foods and high-fiber foods means less tummy trouble and less cravings. Who Should Eat A Raw Foodism? Anyone can and will benefit from a raw foodism. At its core, it’s simply eating healthy. For starters, raw foods aid in alkalizing the body, reducing acidity, and have a lower chance to fermenting in your gut, which can cause autoimmune reactions and inflammation. Also, cooking foods makes them more difficult for the body to digest and the cooking process can destroy some vitamins and nutrients. So how are enzymes in foods impacted when you cook them? Let’s take a look. With experts in the matter disagree a little, foods heated past 112 degrees Fahrenheit supposedly keep less important enzymes. Digestive enzymes break down food in the body. If you’re wondering why this is important, well it’s not just about how good something is for you, but how your body is able to absorb that goodness too. The pancreas and various, other enzymes, aid the body in digesting (known as endogenous enzymes). Raw foods can supply enzymes (known as exogenous enzymes). Increasing our exogenous enzymes intake makes it easier to fully digest nutrients without wearing down out systems. So what foods are more susceptible to loosing nutrients? For starters, foods high in antioxidants are because phytonutrients don’t do well in high temperatures. This temperature varied from food to food, and it is called a food’s “heat labile point,” because it is the point where chemicals within food begin to transform and food overall becomes less nutritious. (Another great reason to include raw foods into your diet is because they go through our digestive systems with more ease than non-raw foods. Foods that stews in our digestive tract for a long time can ferment and cause issues with your gut, like excess gas, a buildup of toxic waste, and inflammation. During the process of fermentation, fats turn rancid and protein can putrefy in your gut, all of which can mess up the mucus lining in the guy, which can result in leaky gut syndrome. Last, raw foods affect the alkaline/acid levels in your body. Some illnesses and diseases develop easier when acidity rises, because this can lower your immunity. Your body can grow acidic because of pollutants, stress, or refined and processes foods. Raw foods can help with acidity, because unlike cooked foods which can raise acidity in the body, raw foods help alkalize your body and neutralize acid. Another benefit you may see on this diet is weight loss! Raw foods are often low in calories, and you’ll be eating lots of fiber, which will help you feel full and curb your cravings. Is There A Difference Between A Vegan and Raw Foodism? In short, yes there is a difference. Raw foodism can include raw dairy products, raw fish, and raw eggs whereas a vegan diet cuts out all animal products. Period. On a raw food diet, you can still eat some animal products, even some cooked meat. Again, your goal is to improve your overall diet, not make yourself miserable by denying yourself the foods you enjoy. You want to eat a diet that is full of less processed gunk, and full of more natural, clean foods. No animal products at all and no cooked foods either. Consequently, this diet may be difficult for most people to keep up with. Not to mention, contrary to most pseudo-science, there is an abundance of nutrients to be found in animal foods like chicken liver and kidneys. These superfoods are full of nutrients like iron, phosphorous, and vitamins A and B. Certain nutrients, like omega-3 fatty acids, can be obtained easier through animal products like fish. Organ meats tend to be more nutrient dense over vegetables like carrots and spinach. Foods like eggs are an excellent source of choline, and beef is loaded with selenium and zinc. So what does this mean for those wanting to become a raw vegan? Personally, it’s a no go from me. You’ll find it hard to get the nutrients you need as a raw vegan, and while many plant-based foods are abundant in proteins, they usually aren’t complete proteins that contain all the essential amino acids your body needs. Animal foods are loaded with nutrients. In fact, proponents of the Paleo diet encourage eating animal products and lots of raw foods, and is overall a diet plan full of great ideas. However, in my opinion, the downside of the Paleo diet is that they tend to eat far too much meat to be sustainable for the average person, and they don’t stress the importance of organic vegetables. So How Can I Consume More Raw Foods? It essentially all comes down to balance. Your body will thank you when you eat raw foods, but you won’t do yourself any harm by eating a few cooked foods either. You should try to add these foods slowly into your diet. Furthermore, you want to make a lifestyle change, so making it a bit to do some of these things will help you add more anti-inflammatory and raw foods into your diet. Fill half of your plate with organic fruits and vegetables at each meal. A good chunk of those veggies should be raw, but cooked vegetables have their benefits as well. Lightly cooking, or steaming vegetables and utilizing slow cookers, at temperatures below 100 degrees, is the best way to cook foods on a raw food diet. Again, you don’t have to go 100% raw as there is nothing wrong or unhealthy with eating cooked foods. Humans have been doing it since we discovered how to use fire. However, the majority of your diet (think about 80%) should be raw fruits and vegetables. This is a lot easier to do than it sounds as there are a wide variety of foods you can cook at less than 115 degrees (Fahrenheit). Eat healthy fats. Yes, some fats are good for you. However, trans fats, partially hydrogenates oils, soybean oil, vegetable and canola oils aren’t good for you. Swap them out with foods like grass-fed butter, seeds, nuts, and avocado, and use coconut oil, or olive oil. You want to eat animal products in moderation, and you want to make sure you’re eating quality animal foods. You will reduce your exposure to herbicides and pesticides, and hormones and antibiotics in meats. Plus, you’ll be getting lots of nutrients. Ditch refined grains and sugary snacks. Foods like cereal, white bread, white rice, white pasta, pizza, and most condiments, fruit juices, canned foods, soups, and yogurts with artificial sweeteners in them should go. Swap them out with sprouted grains, like sourdough bread and real raw fruit (if you need a sweet snack to satisfy your cravings). The process of fermentation turns inedible foods like legumes into edible foods. If you consume a lot of fresh fruits and vegetables, seeds, nut butter, healthy oils, fresh herbs, and herbal teas, you’ll feel much better (and you’ll probably look much better too!). These foods will also fill you up and leave you feeling satisfied, so you won’t be reaching for that bag of chips an hour after dinner. Why Fermented Foods Are Important? Fermented foods are extremely healthy, and one of the best foods you can incorporate into a raw diet. In fact, people have been eating fermented foods for as long as they’ve been on Earth (probably). For starters, there foods are raw and contain a good amount of probiotics, which they get during the fermentation process. You can find fermented foods easily in any grocery; just look for kombucha, yogurt, sourdough breads, and kefir, as well as vegetables like kimchi, kvass, and sauerkraut. Probiotics are “good bacteria” in your gut that support healthy digestion and a healthy immune system. After your body gets rid of toxins, these helpful bacteria will invade your gut and make you feel good, because probiotic foods can help clear up your skin, keep your gut healthy, and improve your body’s immunity. It may even help you maintain a hormonal balance and lose weight. Even if you don’t choose to go fully raw, you’ll gain a lot health wise from simply adding fermented foods into your diet. They can prevent a host of digestive issues, skin problems, autoimmune diseases, candida, and infections. What’s not to love about that? What Are The Downsides Of A Raw Diet? Well, a completely raw diet may not be that great for you. Cooking some foods actually brings out their nutrients, and allows people to eat healthy animal foods that you probably wouldn’t eat raw (although there are some animal foods you can eat raw). Look at is this way: cooking some foods makes them lose their nutrients, but this isn’t the case for all foods. Some foods become more digestible after you cook them. Foods you should cook include those with lycopene and beta-carotene: tomatoes, sweet potations and squash! Cooking foods can also kill harmful bacteria and other pathogens that live in certain foods (think fish, meat, and eggs). Some veggies have goitrogen compounds that can lead to hypothyroidism. Cooking these foods, however, deactivate these compounds and makes them safe to eat. These foods are usually cruciferous vegetables, such as cauliflower, mustard greens, cabbage, kale, broccoli, and Brussel sprouts). Furthermore, some research has shown that cooking some foods, like mushrooms and peppers, cause them to become more nutrient dense. With all those health benefits, you may be wondering if anyone wouldn’t benefit from a raw diet. Well, yes. 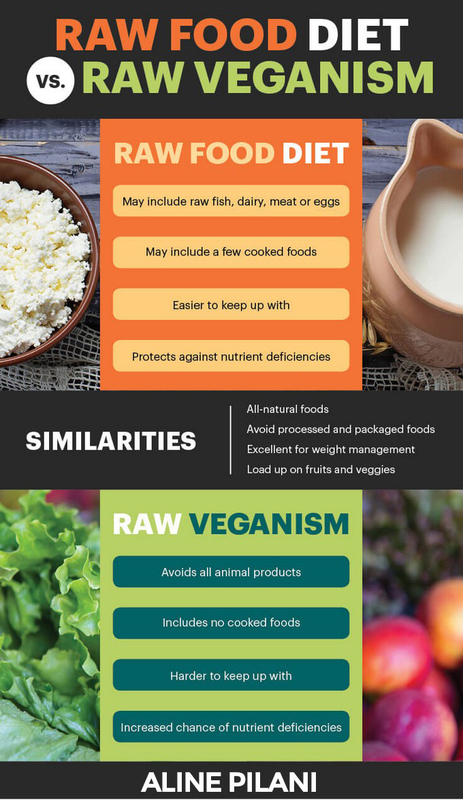 Eating raw food will never hurt anyone, but a raw diet may not work well with those who have a delicate digestive system, and are prone to bowel diseases such as ulcerative colitis will benefit from cooking your food at home! Being unable to digest our foods properly, and get the vitamins we need, can cause nutrient deficiencies and other diseases. Remember, raw foods can be difficult for some people to digest, especially those people who lack certain enzymes. For people like that, cooking most of your food will help you in the long run! 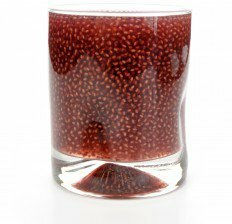 There are some nutrients you simply can’t get as a raw vegan (at least not easily). As such, a raw diet is the better option as you can eat some animal foods, as well as some cooked foods from time to time, so you aren’t at risk of missing out on any nutrients. A general rule of thumb to follow when filling your plate is to fill half of it with raw, non-starchy vegetables and fruits. Light cook your food as lower temperatures (below 100 degrees). Steaming and using slow cookers is another way to go. Also, ditch bad fats for healthy fats like avocados, and get rid of refined grains and sugar. Fermented foods are very important when it comes to going raw. Should I Go On A Raw Foodism? The answer is yes! There is no harm done to your body by going on raw food diet even for just a short while. And the great thing about a raw diet is that you can adjust it to your own needs and tastes! You don’t have to go 100% raw to reap the health benefits from raw foods. 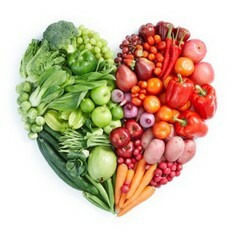 Don’t forget to share this article about Raw Foodism with others using social media icons below!